Boron cluster are developed as boron anti-tumor agents for BNCT – Boron Neutron Capture Therapy – radioimaging/ radiotherapy with iodine containing B-compounds and X-Ray contrast. The stable isotope of boron 10B (19.8% natural abundance) readily captures neutrons, while the 11B isotope does not. Biomolecules and drugs containing 10B-enriched carborane and borane substituents (which preferentially localize in tumor cells and rapidly clear from normal cells) can thus be used for cancer therapy. When the 10B nuclei are bombarded by thermal or epithermal neutrons, they undergo a fission reaction that produces high energy particles by the reaction. Since the particles produced travel only about 10 mm or less, they selectively destroy cancer cells where the 10B nuclei are localized. This process is known as boron neutron capture therapy (BNCT). It has been shown to significantly prolong the lifespan of patients with brain tumors, and a number of BNCT reagents are currently in Phase I and II clinical trials. BNCT reagents are usually based on 10- to 12-vertex borane cages. 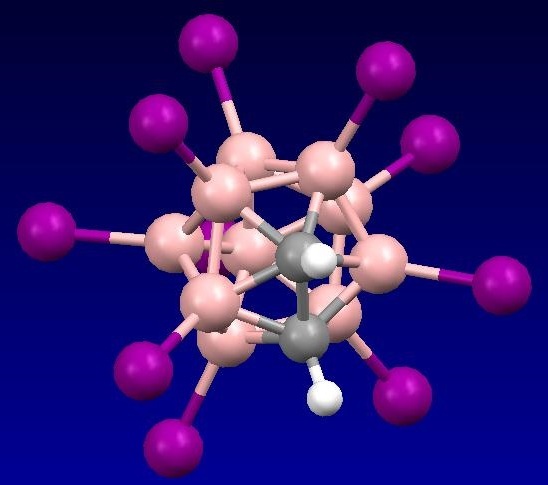 The efficiency of the method is related to a high concentrate of 10B atoms, thus the group is interested in producing new boron clusters with high number of boron atoms. The synthesis of iodinated and highly iodinated Boron rich molecules to be used for imaging/radiotherapy and as X-ray contrast agents respectively has been accomplished. Radioimaging: Radioactive halogen isotopes play an important role both in biomedical research and in clinical practice. A variety of decay schemes allow a wide range of applications in the field of nuclear medicine. Selection of radiohalogen label can be made in accordance with the objectives of individual biomedical experiments and the “time window” required. In this area our interests aim at the synthesis of various functionalized derivatives of polyhedral boranes that can be used as links for the radiohalogen labeling of macromolecules for radiodiagnostics and radiotherapy. As part of it is the synthesis of stable metallacarborane complexes of different types that can be used as potential carriers of radioactive metal isotopes for radiodiagnostics purposes. The design of water-soluble boron-rich macromolecules is of significance for boron neutron capture therapy (BNCT) or for drug delivery. We have been interested in the study and preparation of new macromolecules functionalised with anionic Boron clusters at the periphery to provide new compounds with high Boron content that increases their solubility in water for medicine applications. Different synthetic strategies have been developed for the incorporation of carboranyl derivatives (neutral and anionic) at the periphery of dendrimeric structures to obtain boron-rich nanosystems. These metallacarboranes obtained from nido-dicarbaundecaborate anions [C2B9H11]– exhibit a remarkable kinetic stability and enzymatic invisibility due to their inorganic composition that prevents their catabolic degradation in vivo. By using Herrmann’s catalyst in toluene at 100ºC, 2-I- p-, 3-I-o-, 9-I-o-, 9-I-m-carborane, 1-phenyl-3-I-o-carborane and 1,2-diphenyl-3-I-o-carborane have been radiolabeled with 125 I in high to excellent yields. 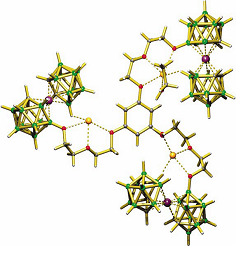 X-Ray contrast: 1, 3, 9 and 10 iodine substituents on the intensively studied o-carborane have been obtained for the first time by combining nucleophilic and electrophilic sequential processes. “Boron Compounds for Radioimmunodiagnostics and Radioimmunotherapy”, INTAS Cooperation, EU. C. Viñas, G. Barberà, J. Oliva, F. Teixidor, A. J. Welch, G. M. Rosair, Inorganic Chemistry, 2001, 40(26), 6555-6562. This entry was posted in Boron Compounds for Biomedicine: Pharmacophores, Transport/Drug Delivery and Diagnostics/Biosensors. Bookmark the permalink.